Forensic Architecture turns its counter forensic gaze to the frontiers of contemporary war. 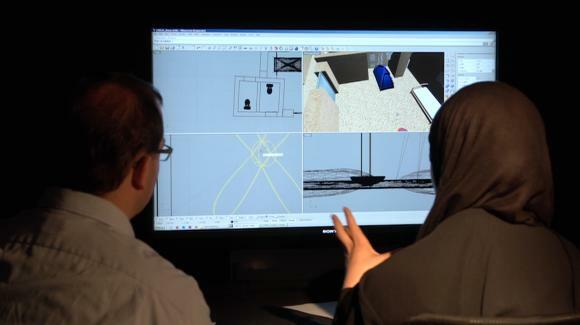 Forensic Architecture, an agency composed of artists, filmmakers and architectural researchers, uses architecture and its media representations to analyse and respond to political conflicts in Israel/Palestine, environmental violence in Guatemala and their research for the UN on drone warfare in Pakistan, Afghanistan, Yemen and Somalia. Weizman will show how architectural methods and new sensing technologies could be used to expose the logic of violent conflict while raising a host of conceptual problems to do with the thresholds of vision and law. In its authentically multi-disciplinary and collective approach, in its degree of engagement with urgent spatio-political-juridical issues, and in its recognition that cultural production has something important to offer to public realm discussions of such issues, which other categories of research cannot provide, The Centre for Research Architecture may be the only truly 21st century graduate arts program around. This is not a case of artists or architects trying to compensate for what corrupt government ignores, or what capitalism destroys (the trap into which much progressive art today falls); this is an approach that rewrites cultural roles altogether. Here’s a short video of one of the program’s cases, presented by Weizman the other evening. The video represents both their working method and acts itself as a form of forensic evidence identifying the Israeli soldier who killed Nadeem Nawara, a teen on the West Bank. 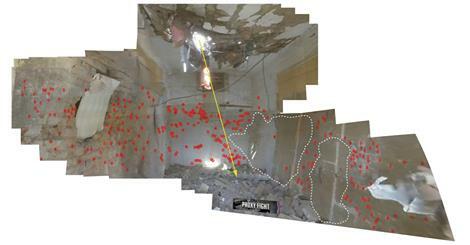 The case study is “a field of practice and…an analytical method for probing the political and social histories inscribed in spatial artefacts and in built environments.” The motivation for the forensic study was to refute Israel’s contention that no investigation was warranted because no live ammunition was fired; the work proves where the shot came from, and its lethality through a spatio-aural-temporal investigation of the event. There are credits at the end of the video, with their own hierarchy. But in part because it would be hard to identify such work – today – as cultural production, the main role of the credits isn’t individuation in the sense of the contemporary branding of artists or architects. Although it was developed out of the discipline of architecture, the Centre redefines what a cultural practice might be today for artists. Its approach to the generation of cultural material is more genuinely collective than the collective label loosely attached to some art practices today. It breaks new ground in the ways in which it includes artists in re-shaping a public reading of spatial languages and the dense meanings they hold, as they are imbricated in zones of cross- and intra-national incursion. Significantly, it steers cultural production away from a speculative marketplace of aesthetic signifiers (i.e. the auction house and the gallery model), or at least creates a new space for cultural production and a new spectator for it. This type of program has the potential to offer a way out of the American M.F.A. impasse for artists committed to critical and politically engaged work, who upon graduating (often with massive debt) are abandoned in an economic tundra, or left to parlay their technical skills in the world of advertising and marketing. In this sense, The Centre for Research Architecture can be thought of as concerned with ethics at many scales, including the pedagogical one. This work utilizes the technologies of Computer-aided Design (CAD) to achieve a counter forensic. Weizman’s talk included quite a few different discourses – technological, cultural, historical, juridical, human rights, spatial, political, and philosophical. Several brilliant questions were raised after the talk. But what lingered for me was an unasked one. What seems under-examined in this remarkable work is the question of what place it can occupy at a time when “truth” has so little currency. In other words, the work recognizes that juridical appraisal is not guaranteed to be accurate, let alone just, and insists on the vital importance of bringing out of the shadows –through innovative methods– the occluded actions that cause destruction today (another project focuses on the secret life of drones by reconstructing with stunning precision the exact location of a secret attack). But an attention to the psyche of the addressee, and the reception of truth, seems to be missing. It may be present in the more academic part of the program (I haven’t seen syllabi), but it wasn’t present in the lecture. And the psyche is an essential focus because it would allow for a more nuanced strategic presentation of the material in the public realm. Ideally it would also affect the very language and imagery and sound of their counter-forensics. For example, by an oblique analogy, it’s futile to try to convince supporters of capital punishment in the U.S., through a medically proven argument, of the suffering caused by botched lethal injections. Those who support capital punishment support the suffering of the sentenced, in part because they don’t identify (with) the convicted as human. To be effective at all, a discursive argument would have to be focussed on that lack of identification. Weizman pointed out that they don’t function as conventional forensic experts do, in that for them the timing of the output of results into the public realm is strategic, and differs from how the law might typically use forensic experts. He also pointed out, in response to a question, that the affective dimension of the conflicts have to be taken into account (in addition to the diagrammatic science). The value of their approach exists at a discursive level as well as at the level of forensic proof. But to aim for truth – or even for its discursive value – one has to examine in depth the contradictory ways in which the psyche transforms it.